With increased efficiencies from different heating systems, it’s more important than ever to be sure that your chimney remains a safe and undamaged piece of your house. H.B. Steele & Son has the knowledge and expertise to replace or install chimney liners all over Schuylkill County. The higher efficiencies of new heating equipment reduce flue stack temperatures which wastes less energy BUT gives way to the condensation of flue gasses with acidic properties. These factors increase the deterioration of ordinary masonry block and terra cotta chimneys. 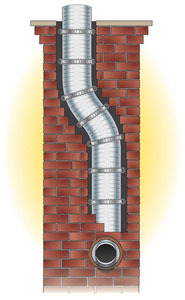 Thermal shock, stemming from extreme temperatures, causes flue liners to become brittle and crack. Damaged liners can lead to carbon monoxide releasing into your home, chimney fires, or puff backs, as well as increased inefficiencies of your heating system. If you feel your chimney may be in need of a liner or have any questions about these issues, please contact us and we will be glad to answer any questions you may have or send a technician out and provide you with a FREE estimate.